Some people think of pigs as lesser creatures, possibly due to their reputation for spending time in the mud (and the fact that they're very stinky.) But we want to know: lesser than what? Because pigs, as it turns out, are pretty nifty animals. In fact, pigs are just about as smart as chimpanzees or dolphins. They have such a keen sense of smell so they're able to locate underground truffles, whereas our dogs don't even seem to know what truffles are! Turns out pigs are stinkin' fantastic! If you want to transform into one of these intelligent and loveable barnyard animals, we have just the kit for you. The pig nose, ear, and tail set are all covered in soft fabric so they're comfortable to wear and they fasten to you easily too. 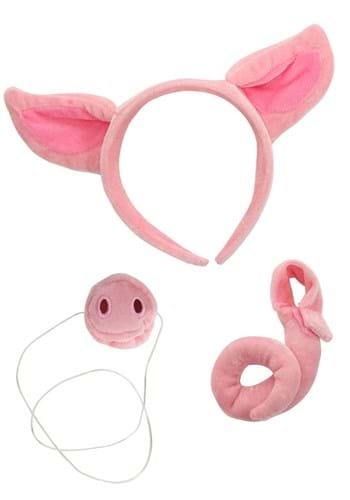 The pig nose attaches with string while the tail accessory uses Velcro. You're well on your way to being one happy pig in the mug. Now that you have this kit, complete your costume by wearing all pink clothing. You'll be one thrifty piggy with a cute and convincing costume so if you want to frolick in the mud, go right ahead!